E-bike cycle tours, Nelson, New Zealand. Electric bikes are the latest addition to our fleet here at The Gentle Cycling Company. Our electric bikes are electric assist, which means that when the motor is on, it assists the cyclist all the time. The motor has different power levels, so you can choose to have less or more assistance. 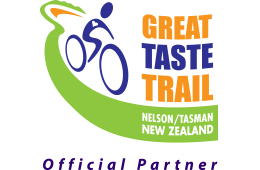 On the Great Taste Trail, there are significant areas where the trail is flat. The bikes have a digital display and this displays the range. Most electric bikes have a maximum range of at least 100 km on the lowest power level. Of course, if you are going up a hill and need more assistance, you will have less range. As you ride and the battery becomes more and more depleted, the decreasing range is displayed on the digital display. Re-charging the battery from fully flat takes around four hours. The batteries can be re-charged on the bike, or can be removed using the key. Our electric bikes have 8 gears, which are used just the same as when riding a standard bike. They have a moderately chunky tyre, providing more grip on gravel. Riding an electric bike demands virtually the same skills as when riding a standard bike. Cyclists need to be confident with basic skills such as balance, braking, cornering and gear changing. It is important to understand that riding an electric bike is not appropriate if the rider is not a confident cyclist. Basic fitness is also required, as the legs are still going to be working. 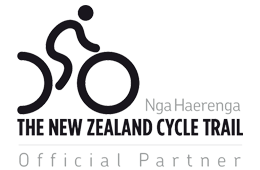 In NZ, most electric bikes have a maximum assisted speed of 25 km/hour. When they reach this speed, the motor cuts out. You can of course, go faster than this down hill. You could expect to cycle at an average speed of between 15 and 20 km an hour on varied terrain. With the motor off, you can ride quite easily on sealed, flat terrain. Riding an electric bike makes it easier to go further, as less stamina is required. Managing head-winds and hills is much less demanding when riding an electric bike. They are a great way to extend your daily cycling distance. It is relatively easy to ride up to 60 km a day on an electric bike.